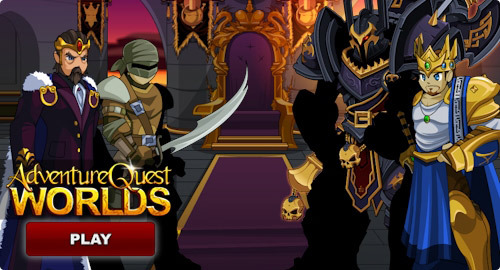 Do You Have What It Takes To Break AQWorlds? We release new content EVERY WEEK! (Sometimes, multiple times a week!) If you are an experienced, friendly, and helpful AQWorlds player, know the game inside out, upside down, and right-side 'round, and are willing to spend countless hours playing the game to test, break, and help FIX it... then we want YOU! AQW Team Searching for New Testers! We are posting this on the Design Notes first because we ALWAYS want to get people from our community. You all know the game as well (and sometimes better O_O) than we do, so it makes sense to bring new help onto the team from our player community! Real life has stolen some of our testers away over the last few months, (shakes fist at real life), so it's time to buff our team count! We will be looking at your AQW account history, social networking and forum accounts if you have them, and arranging an in-game interview to talk one-on-one with potential candidates. If your e-mails subject line says anything except AQW TESTER APPLICATION then the filters will automatically delete it. Reading comprehension is good. Include your country of residence. Include your Master Account name and email address tied to the master account. Include your Forum account name and email address if you have a forum account. Include all Languages you speak/read. Include the days and times you're available to help out! We really need some people who can help during Friday's release testing, but if you can't, don't worry - some types of testers can do their work at any hour. Include a Resume (C.V.) *please note we'd like the resume in English. You must be 18+ to be considered for these position(s). One application per person. We will read and consider all applications, but cannot reply to them all. If you are chosen to go through a further interview, we will contact you by e-mail. If we do not respond, we want to thank you for being awesome enough to volunteer! Please note that this is an unpaid, volunteer position but does come with in-game Tester status, free AE game memberships, AdventureCoins, the chance to test game content as we develop it before release and invaluable experience with a honest-to-goodness gaming company which will look good on ANY future resumes. Thanks, good luck and Battle On! Chaos Paragon Limited Quantity Set Leaves Thursday! Dage's Paragon gear is some of the most popular in game, and we couldn't pass up the opportunity to do a Chaos-themed version. but it's almost time for it to go. The set goes rare PERMANENTLY on August 1st, no matter how many sets are still left! Head into AQWorlds and find the Chaos Paragon Set badge in your Book of Lore! If you've been on the internet recently, you may have heard about the new Guardians of the Galaxy movie. Memet is a HUGE fan, so we definitely have! She got early-release tickets to the Gaurdians of the Galaxy movie and came back RAVING about how awesome the movie is. 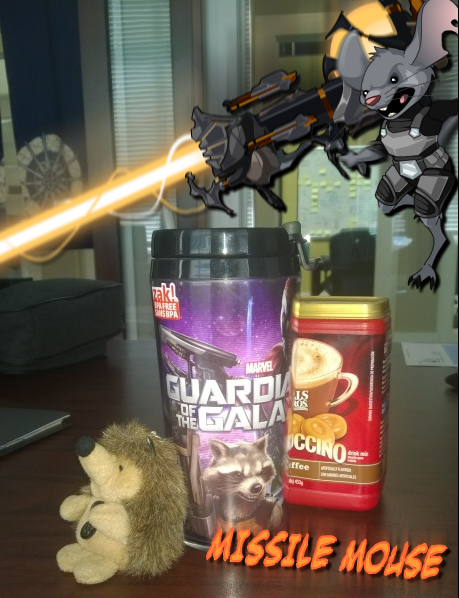 When I asked her to make GotG-inspired gear for a shop/item hunt, she almost dropped her GotG coffee mug! There were so many great ideas for the gear, we pulled Laken and Blade in to help, too! Next Wednesday, begin the hunt for our gear celebrating the launch of the Teenage Mutant Ninja Turtle movie! Many of our artists are lifelong Turtle fans... they've been Find the Kappa-tastic gear dropping from many of the monsters in the Yokai zone! After a year of taking chances, daring fate, and risking DOOM... the Carnival of Fortune is closing its gates on August 23rd! This is your last chance to use your Fortune Tickets to get drops from the Wheels of Doom and Destiny. The Doom and Destiny merge shops will remain in-game and available for those who still have Fortune Potions to spend in them, or may be obtained in the coming Daily Login System revamp. 7th Lord of Chaos Fan Art Contest winners announced! Exciting news, folks! A new Chapter has appeared in the Lorepedia! As you can probably deduct, this chapter unfolds the pages that contain the Chaos Lord Fan Art winners! This is a dream-come-true! 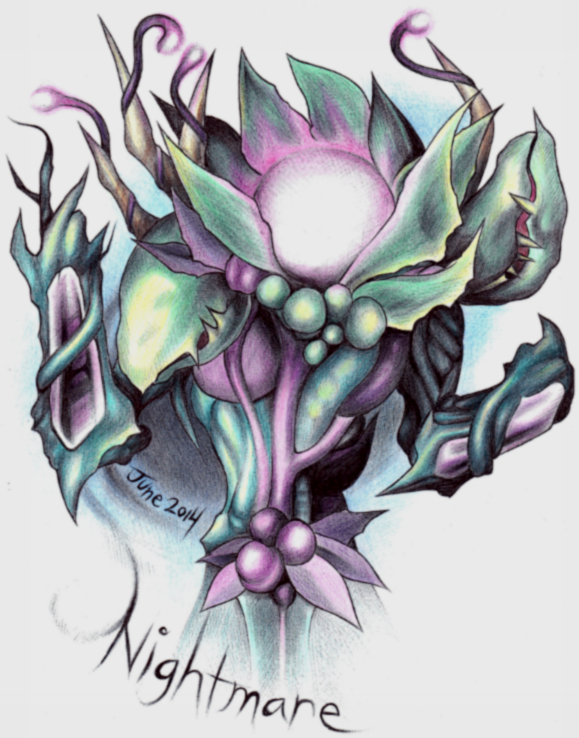 Fellow player Nightmare created this AMAZING Chaos Lord Ledgermanye fan art and won the Grand Prize! Your artwork is truly magical, Nightmare. Please accept: 1,000 AdventureCoins, the exclusive color-custom Chaos Paintbrush + Chaos Artist Palette dual weapon set, the Art of Chaos character page badge, AND your art as an in-game House Item (which will be released at a future date)! Please click here to see the 2nd Place, 3rd Place, and Runner Ups for the Chaos Lord Ledgermayne category. Great job everyone, and keep up the wondrous work! Life or Death Battles Ahead! As Dage, Nulgath, and ALL of the forces of evil gather to assist Empress Gravelyn, the undead trapped in Death's Realm grow uneasy... the urge to join their masters has sent them into a frenzy! If you are going to battle your way out of Death's Realm to help Empress Gravelyn, you will need to defeat MANY monsters, including the Infernal Warrior and Toxic Fiend, both of whom were lost to Death's domain centuries ago. Death waits for all heroes... even you! Infernal Caldbolg Blade and Quest! 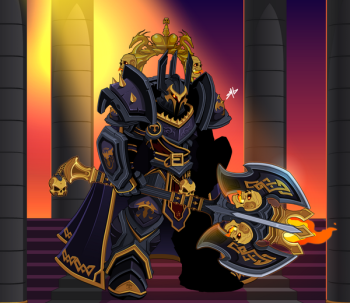 In addition to the other gear in the Living Shadows Rares shop this Friday, the Infernal Caladbolg Blade will also be available for 3000 AdventureCoins! Will you master the blade... or will it control you? The blade will unlock an exclusive quest to gain the Dual Infernal Caladbolgs, along with a Shadow animation, Rep and Class points bonus! 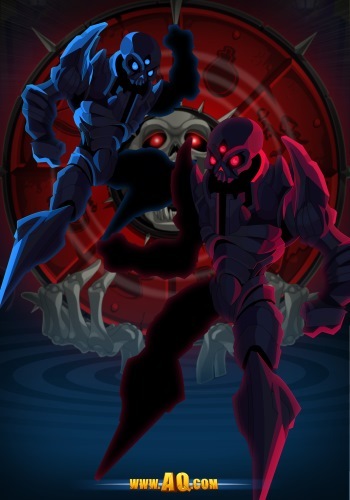 Next Month: Nulgath Gear Arrives! Do not disappoint the ArchFiend. Nulgath has been working on a new Void Beastmaster set for an upcoming project, but will ALSO have a Rares Shop in a few weeks along with many of the Oversoul-themed items as permanent quest and drops in the Tercessuinotlim zone! Gear Up For Gravelyn's Attack on Chaos! If you played the last 13th Lord of Chaos Saga release in the /drakathfight map, you're wondering "... HOW can I do THAT? Didn't I (spoilers removed) ?!?!!" Yes, yes you did ... and that is a life-or-death obstacle you'll need to demolish in order to reach her! If Gravelyn succeeds, Shadowfall will rise, the ShadowScythe will strike, and the Living Shadow Assassins will stalk the realms of Lore to do her bidding! * You must have completed the Mount DoomSkull release to begin the ShadowRise story. /Join MountDoomskull to begin it. 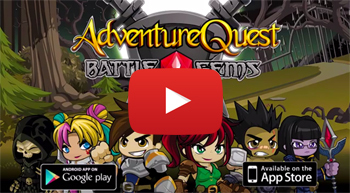 AQWorlds, Artix Entertainment, and Beleen nominated in Dragon Slayer Awards! Ohhhh yes, you read that right—thanks to you and our wonderful heroes, we’ve been nominated to win the coveted Dragon Slayer Trophy in the 3rd Annual Dragon Slayer Awards! Cast your vote at http://community.guildlaunch.com/promotions/g/DragonSlayer/ and help us win—because if we do, EVERYONE will win too! 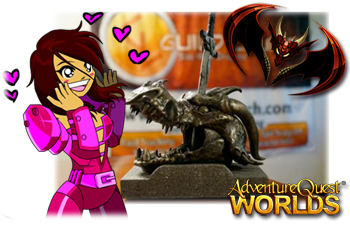 Tehehe, glad you asked =) If—and hopefully when!—Artix Entertainment, myself, and/or AQWorlds wins a Dragon Slayer Trophy, we would need to start recruiting fellow Dragon Slayers—like YOU. Dage the Evil is horned to forge a brand-new Dragon Slayer Armor Set (for you and me and everyone else to enjoy) IF we win the Dragon Slayer Awards (and possibly a special Pink Dragon Slayer set If I win, too)! AWESOME—what are the Dragon Slayer Awards? Hosted by Guild Launch and GameSkinny, the Dragon Slayer Awards are a fan-nominated award for communities in online gaming, focusing on community managers, community builders, and community members (that means you!). Your vote will be cast as you click each contestant’s name, so be sure to vote for AQWorlds, Artix Entertainment, and Beleen (that’s meeee!) so we can win the Dragon Slayer Awards Trophy! Vote for AQWorlds, Beleen, and Artix Entertainment here! Relive the Birth of the Champion of Chaos! Drakath, the Champion of Chaos, has had only ONE goal all along... and tonight you'll learn exactly what that is but more importantly... WHY his desire to raise Chaos and destroy YOU has been all-consuming! Confront Drakath in a NEW form! Tonight, /join falcontower to go back in time! 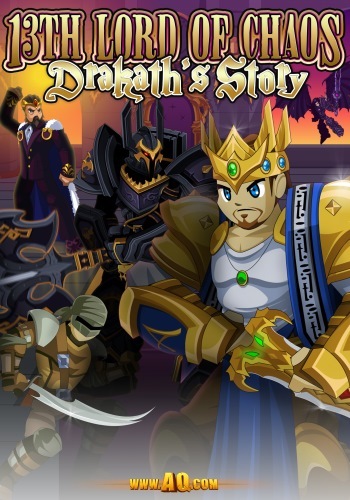 After last week, you learned about Drakath's father, King Slugwrath, and Prince Drakath's early years as a bandit. Now you'll see his rise to power, his greatest ally and his worst enemy... and the Queen who frees him from ALL debts, except the one her owes HER! After you defeat tonight's three bosses, you can face the final two in challenge maps and complete Lady Celestia's daily quests to gain Seals of Light and Darkness! Collect 100 seals (50 each) to earn the Bright Knight armor! 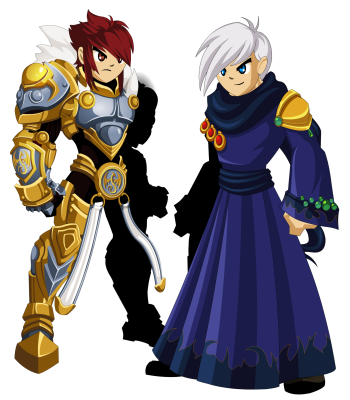 The Knight of Light +5 and the ArchMage's Wrath armors are available in the Chaos Rares Shop*! The Knight gives you +5% more gold and damage against undead. The ArchMage's Rage has an item animation. OR you can complete the Daily Quests AND pay 1 million gold for a free player version of the Knight Armor (no bonus). A free-player version of DragonFable's ArchMage armor (no animation) is available from the Chaos Rep shop for rank 10! * Knight of Light +5 will be moved Monday, as it is not going rare. 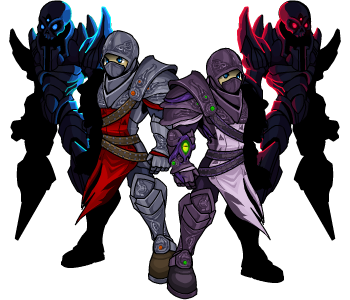 DragonFable's Archmage armor WILL go rare, as will the ArchMage's Wrath. Upgrade to unlock new exclusive sets! Legends should log in NOW, because the BitterHeart and FlameBlade Assassin sets are live! Talk to Ragnar in Battleon to access all 28 items from both sets in our newest Legend-only shop! Each month, the shop will get a new exclusive set only available to Legends! We've been doing a lot of upgrade packages, and that means we've got a LOT of Legends running around! The Monthly Member Shop will feature an exclusive set (or two) each month, each as showstopping as these! If you have an active membership, you'll be able to open the shop and buy the gear right away! Gear in the shop will be available for various amounts of gold, so if you haven't had a chance to save up, there will still be a lot for you to get! AQW Is Looking for More In-game Moderators! We have always said that we make these games for and WITH you... and that's why so many of our team members began as regular players! Now we need some of you to join Reens, Sora, and Stratos' in-game moderation team to make AQWorlds a safer, funner game for everyone! Interested? Read our Volunteer Mod Hunt Guidelines! If you're 18 or older, have a clean game account history (for at least the last several years), and want to help your fellow players, check it out today! STATUS: APPLICATIONS ARE NOW OPEN! Everyone knows that pandas are skilled Kung Fu masters. 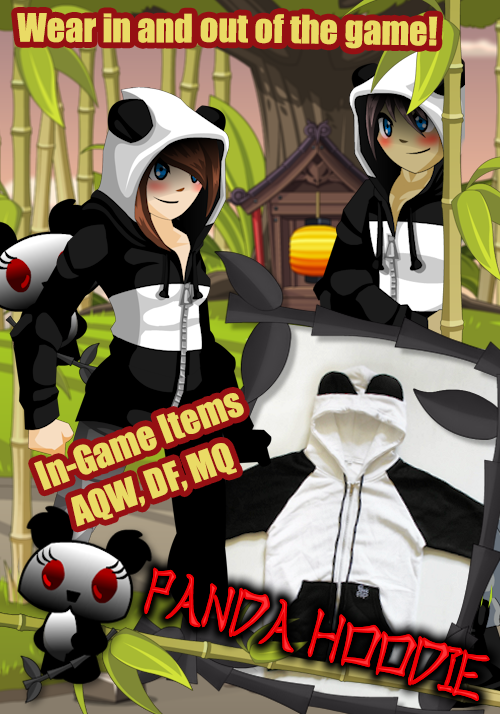 And when you get your paws on the Panda Hoodie* at HeroMart, you’ll unleash pure pandamonium upon the world! Turn a grizzly situation into fun by ordering your Panda Hoodie at HeroMart.com! New Release on Friday, July 25! 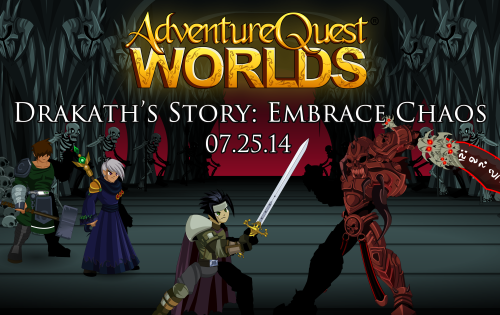 Check out all the new NEW happening this Friday, July 25, in the best free MMO, AdventureQuest Worlds! Who is ready to embrace Chaos?! Discover Drakath’s past... through his own eyes! If you hope to save the future of Lore, you must first understand the past of the Champion of Chaos himself! New exclusive set(s) added each month! Only upgraded Legends can harness these elite items, so if you want to get the best loot in the game, consider becoming a Legend today! This is your last chance to get the Chaos Paragon Set, because it’s leaving the Limited Quantity Shop on August 1st! Become the Chaos Paragon in AQWorlds! Get more AdventureCoins here if you need a refill, and prepare to dominate the battlefield as a Chaos Paragon! Get your paws on the Panda Hoodie, arriving this Friday at HeroMart! No one can resist the Panda Hoodie—it’s im-paws-ible! Order yours this Friday from www.HeroMart.com to keep your cool in any grizzly situation. As the summer's battles heat up, you'll want to look and stay cool. That's why we're got a shop full of 28 items for our AQWorlds Legends, our Chaos Paragon set for Adventure Coins, and new gear dropping from the Chaos Rep and Rares shops this Friday for everyone! FireBlade and BitterHeart Assassin Sets! 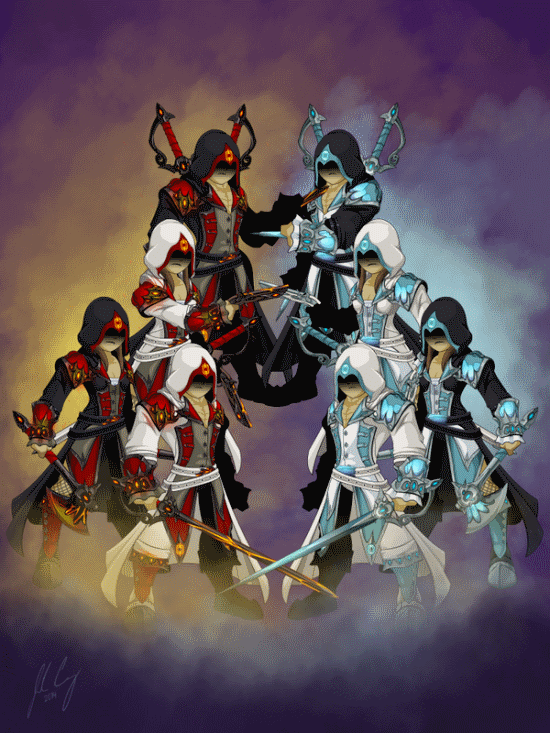 This Friday, the BitterHeart and FlameBlade Assassin sets arrive in AQW! Talk to Rangar in Battleon to access all 28 items from both sets in our newest Legend-only shop! Each month, the shop will get a new exclusive set only available to Legends! Chaos Paragon Limited Quantity Set! We released the Chaos Paragon set during our "Summer of Chaos" limited quantity set event earlier this month... and it's almost time for it to go! The set goes rare PERMANENTLY on August 1st, no matter how many sets are still left! Tonight's Random Midnight Release is LIVE! Presenting AQW's biggest, buffest, BEST arena warrior EVER! If you've ever wanted to intimidate ALL your opponents, then get ready, because Hercules and Herculisa are here to PUMP. YOU UP! 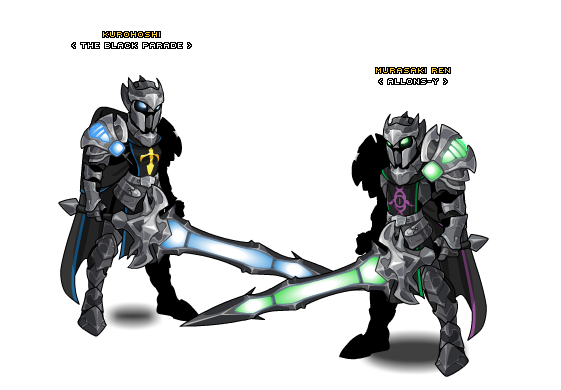 You'll find the Gladiator Powerhouse armor in your game menu for 500 ACs. It will be available until next Monday night! Galanoth: We need a gladiator armor. WAY bigger than anything we've got now. Alina: Ok, so we're talking "hoist a two-handed sword with one hand" type? Alina: ... "Able to lift several dwarven wrestlers" big? Alina: "Crushing cars with their han-"
Alina: I think we can make this happen for you. So Memet got to work on Friday and finished up Hercules and Herculisa (she's Herc's baby sister. It's a family name.) And tonight, Galanoth's dream of wearing AQW gear muscle-y enough to benchpress dragons is a reality! 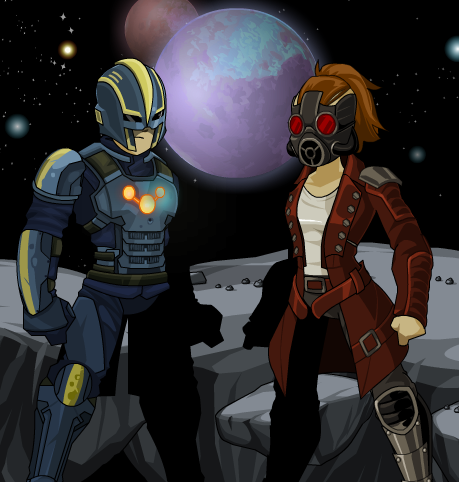 * We have life-size versions of the DragonBlade AND Galanoth's helmet at the secret underground lab. The above conversation is pretty typical. Our in-game moderators are amazing... and more, they're volunteers! They do not get paid for the many hours they spend each week helping keep the game safe and fun for everyone. Because they're volunteers, real-life has to come first; that means that occasionally, we lose some team members to outside responsibilities. When that happens, we start hunting for new mods. Earlier today, we shifted Veronica Dare, one of the game testers, onto the Mod team, as well. (Thanks, Veronica!) More current team members may be making that transistion over the next week or two. NEXT WEEK: Reens is going back to the thousands of applications from the last moderator hunt to pull more potential mods to interview. Our in-game and website QA testers* are ALSO volunteers, and that means the same rules apply - every now and then, we lose some to more important real-life responsibilities. We'll be hunting for more testers for both the game and web QA positions starting next week, as well. For a long time, everyone with a gold name has been called a Mod (short for Moderator) but there are actually 4 kinds of people walking around with gold names. Mods, Game Testers, Help Team, and Devs (short for Developer). Moderators: moderate the game, reading reports and keeping AQW safe and fun. Developers: developers make the game itself - artists, programmers, writers, designers. Testers/QA: testers take what the developers make and make sure it's not broken. Want to know more about the different AQW Team roles? Read THIS! * QA stands for "quality assurance"
Relive the Champion of Chaos' Origin Story! For years, you've battled Drakath, the Champion of Chaos. But how well do you know his story - what turned him from a young Prince into an all-powerful mage bent on achieving a single, world-shattering goal? This weekend, battle through Dreadhaven as Alden, aka a young King Alteon before he ascends to the throne. Then battle through Oaklore Forest as a young Princes Victoria, reliving Drakath's early years to experience the start of his journey towards Chaos! 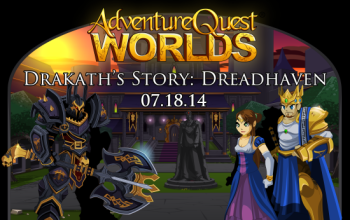 WARNING: this is only the FIRST part of Drakath's story... you'll need to return NEXT Friday to see how it ends! We have a TON of things for you to do tonight! Summer Token 2014 Shop: Talk to Twilly in Battleon to get your token and unlock the gear! Chaos Rep Shop Update: Find the Dreadknight armor in the Chaos Rep shop! War Boss Coming SOON: The Attack on Battleon War Boss will release... and you will learn your TRUE identity! As soon as the war meter hits 100%... you will FINALLY know who you REALLY are! You'll need your friends to take down THIS boss! * Ultradread battle drops the Legend-only version of the set, which gives more XP and does more damage against Chaos! The normal Dreadhaven General battle drops a version of the gear for ALL players! New Release on Friday, July 18! Check out all the new NEW happening this Friday, July 18, in the best MMO, AdventureQuest Worlds! 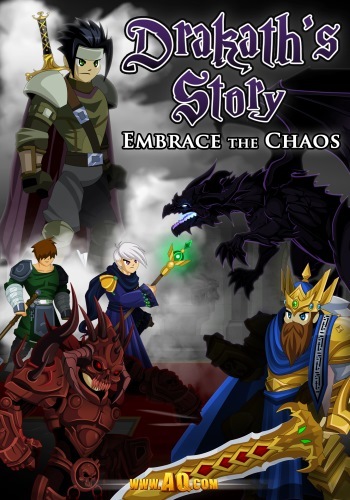 How did Drakath become the Champion of Chaos? Find out this week! Single player adventure: you ARE Drakath! Spoiler alert: your 1st look at the Queen of All Monsters! Uncover Drakath’s past. Understand the present. And foresee the future in this week’s newest release! Summer is here—and so is the Summer Token Shop! Seize the day (and some loot) in the Summer Token Shop! !! Wheels of Doom & Destiny !! On August 23, the Carnival of Fortune will close its gates and the Wheel of Doom & the Wheel of Destiny will be gone FOREVER! Spin Now by typing /join doom in the in-game chat bar! Player vs Player combat is now live in Battle Gems! Gut-stomping battles against your friends! Climb the leaderboard & win trophies! 20 new items in PvP Shop! Battle Gems now offers Gold Packages, so even more exclamation points are totally necessary!!! To make sure you don't miss out on any OTHER rares, mark your calendars with the dates listed here! For years, you've battled Drakath, the Champion of Chaos. But how well do you know his story - what turned him from a young Prince into an all-powerful mage bent on achieving a single, world-shattering goal? This Friday, play as Alden, a young warrior destined to be the King of Swordhaven, and a young Princes Victoria as you quest to uncover the secrets of Drakath's past! 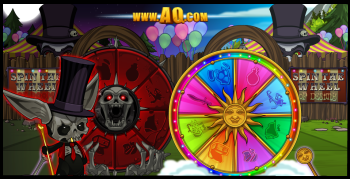 If you spun the Wheel of Doom or Destiny between July 1st and 5 PM server time today, later tonight you'll receive 5 FREE Fortune Tickets to spin the Wheels of Doom or Destiny. If you're a Legend, you'll receive 25 free Fortune Tickets! The first batch of rare Wheel gear will also return, and with a higher drop rate! (As promised when we cycled them out a few months back.) We're getting a lot of questions about what gear will go rare from the Wheel. Keep an eye out for Design Notes later this week with more answers! Earlier today, Yorumi released a patch to PvP that should help the team balance in the Battleon war, but it hasn't done enough from what you guys say. With that in mind, he'll continue looking at the issue (which involves Flash ignoring basic code structure), but in the mean-time we are going to release a PvE version of the war. That way, if you are having difficulty joining the PvP rooms or just prefer fighting monsters instead, you'll be able to contribute to the war effort! With the Carnival of Fortune closing its gates on August 23rd, we've added a ton of new gear as Wheel drops this weekend ! The items are also available from the merge shop for you to get with all the Fortune Potions you've saved up! Prismatic Dragon Morph is color customizable! If you haven't spun the Wheel yet this month, make sure you /join doom and spin this weekend. Every player who spins the Wheel before Monday will receive 5 free Spin Tickets. Every Legend will receive 25 free Spin Tickets! Now available as drops from the Wheels of Doom and Destiny and their merge shops: 6 new armors, 8 new helms, 5 new capes, and 3 new weapons! Not sure what the Carnival of Fortune is? Here's an info breakdown. Back in April, we cycled out the 1% drop items to make room for new ones. When we did that, we said the gear leaving would return at some point in the future. With the Wheels and much of their gear going rare*, we need to do that before August 23rd. Those items will return Monday, and all the 1% items will receive a slightly increased drop rate. * It is possible some of the gear made for and only available from the Wheels will be redistributed to other shops or functionality. The 1% drops will not be included in that list. Yorumi is back to work on the "Room Full" issue from last night's release that is still affecting some of you. We will get that taken care of as soon as possible! Coming this week, we will add PVP Combat Trophy drops to /battleonpvp, as well. 13th Lord of Chaos Attacks Battleon! After last week's encounter in the Lair, the forces of the Alliance and Chaos are even hungrier for blood than ever... and the 13th Lord of Chaos LOVES the havoc being wreaked! This Friday, the forces of Chaos are attacking Battleon, and ALL heroes are summoned to the fight! Will you defend or attack Battleon! Every opponent you defeat will raise your war meter by one point! 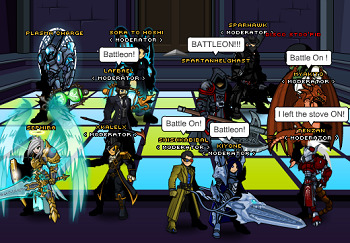 But hurry, because both Empress Gravelyn and the forces of Chaos are rallying more help... Battleon is the one town Chaos does not want to lose, and the one place the Alliance will not see defeated! * Yorumi is working to even out the balance on each side. He hopes to have that out this weekend. If PVP isn't your thing, then never fear! Chaos monsters are appearing in maps throughout Lore, in places they've never seen before! Go on the hunt in places like the Maul, the Manor, the Clubhouse, Sandcastle, and more for the Chaos War medals they drop to show you will keep fighting... no matter what! Then use the medals to create new gear. 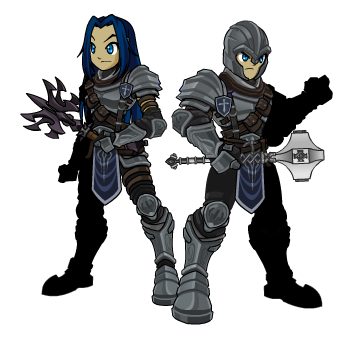 Once your side raises its meter to 50%, you'll unlock the Annihilator of Order or Defender of Order sets! Free-player and Legend versions, with the Legend version giving you a small boost to XP! Make sure you mark your calendar, because we've got a lot of other events, shops, and fun stuff going on! 45 MORE Inventory spaces are available! 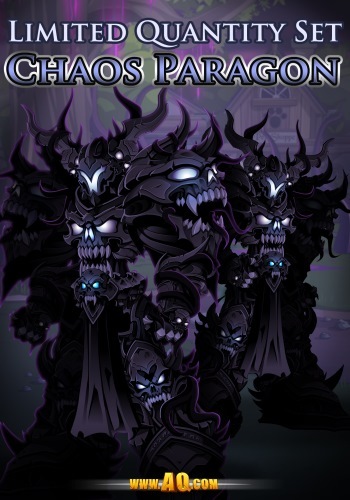 Chaos Paragon Set available until August 1st! BATTLE GEMS PVP IS LIVE! Actually, it's been live for almost a fullday, but we haven't said much about it because we wanted to make sure there were no terribly bad game killing bugs before we sounded the war horns and drew a lot of attention to it. It was a quiet launch. Of course there were a few bugs (There are always a few bugs) but noting too serious and we've already got most of those solved and ready to publish to the live versions of the game in the next update today or tomorrow. And now we're moving on. BATTLE GEMS PVP! What's the deal with that? Create your own cool (or silly) PVP name! Collect PvP trophies for winning that raise you higher in the World and Friend Leaderboards! New PvP Titles unlock the ability to buy new PvP Gear in the PvP Shop! But we now allow you to BUY GOLD! WAIT, DID YOU SAY "BUY GOLD"?! I did indeed say that, imaginary player who asks me this stuff! There are three gold packages to pick from but the obvious winner is the 50 MILLION GOLD PACKAGE. That should keep you set for a while and allow you to buy almost all of the PvP rewards (If you have the intestinal fortitude to unlock them). Plus it comes with in-game bonuses where the other packages only come with gold (which is still nice). the 50,000,000 GOLD package gives you a GOLD NAME (in Battle Gems PvP) and the MAKE IT RAIN skill will be added to your skill list. It's like a big gold fireball that explodes into a shower of gold coins when it hits the target. Fun? Yeah, fun. Get Your Game On With This Ballin' Gear! Though the World Cup will not last much longer, you can show your pride and spirit in-game forever with a souvenir from the AQWorlds Cup 2014 Shop! Talk to Twilly in Battleon to find 4 Legend-only pets and four maces for ALL players! 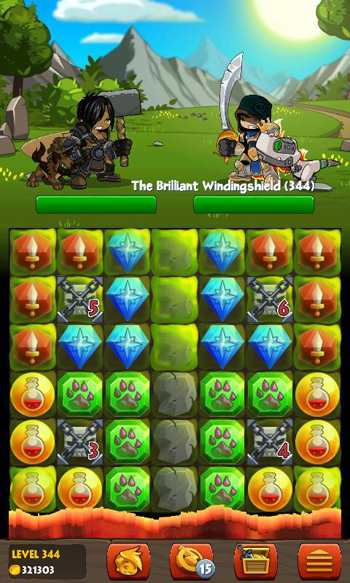 Battleon Battlemage Defender punts for the win! 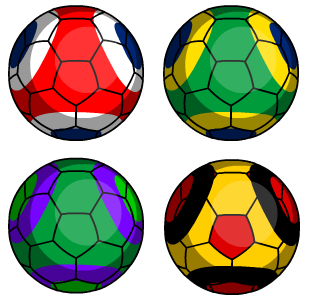 Have a ball rooting for your favorite team! Mark Your Calendars So You Don't Miss Gear! We've got a lot of shops going rare over the next few months, and several that are NOT, and we want to make sure you know about all of them ahead of time! The OMGZilla's leaving date was posted inside the game menu, but because it was not listed on the Design Notes (where many people look for that information), it's returning until Monday. The Chaos Paragon in the LQS was originally set to leave July 14th (according to yesterday's Design Notes), but will remain available through the end of July to allow people on vacation a chance to get the set before it leaves forever! 45 MORE Inventory Spaces: Cap is now 200! Feel like your backpack is a little cramped? Is your bank full to overflowing? We have heard your cries of pain in the game, on Twitter and Facebook, and on the forums! Well, get ready for GREAT news, because we JUST added 45 MORE buyable inventory slots for 200 ACs each to AQWorlds! 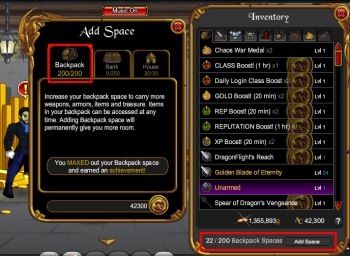 AQW Inventory: now with more room! You can click on the "Add Space" button in your inventory window (like in the picture above). OR you can head North from Battleon up to the Bank (next to the Guardian Tower). Talk to Augold the Banker to buy more slots! Augold: Banker and Hammerspace Maker! You Said You Couldn't Add New Spaces!!! You are correct, disembodied collective player-voice! We said back when we didn't think we COULD add more space. We didn't want to risk increasing lag, but with the numerous improvements over the last year by Yorumi, Zhoom, and Captain Rhubarb, we can add another round! When we find out something you guys want isn't able to happen, we let you know that (as much and as often as is reasonable and possible). But sometimes... sometimes what is the truth of a situation one year changes the next year, or two years after that. When that happens, things we didn't think were possible suddenly BECOME POSSIBLE! That is the BEST way we can be wrong, because it means we're able to do something for you guys we didn't think we could. Thank You For Supporting AQWorlds! The entire AQWorlds team works hard to create releases because you love AQWorlds, and we love that so many of you support the game you love. Thank you for letting us know how you feel about the game, and what you want to see in it. Remember, AQW is YOUR game and you shape it through your suggestions and ideas! Wheels of Doom and Destiny Leave August 23rd! After a year of taking chances, daring fate, and risking DOOM... the Carnival of Fortune is closing its gates on August 23rd! This is your last chance to use your Fortune Tickets to get drops from the Wheels of Doom and Destiny. The Doom and Destiny merge shops will remain in-game and available for those who still have Fortune Potions to spend in them. New gear will be available from the Wheels and merge shops starting this Friday. Some of Friday's new gear! Why are we closing them now, you ask? Good question. The Wheels were always controversial, but many of you guys enjoyed taking a chance to get exclusive items, and hunting for that elusive Ultimate Item of Donated Awesomeness. We thought that was a pretty cool idea, too! More new wheel gear arriving Friday! One of the nicest Legend Perks in the Wheels of Doom and Destiny are the free Daily Wheel spins. We want to keep giving our upgraded players an advantage in getting the newest, coolest gear... so we are transferring the "Legend bonus" to our plans for the new Daily Login System. If you saw our test of that a few months back, you'll know that all you need to do is log in each day to get more and bigger prizes! When we bring back the system, it will have some changes, including a combination of the Wheel and Treasure Chest system (according to the current plan). We are still plotting out the changes and additions we want to make to the daily login system, but we will make sure it's a step up for Legends, while still making sure all our other players get daily rewards, too! Free Spin Tickets Coming Monday! 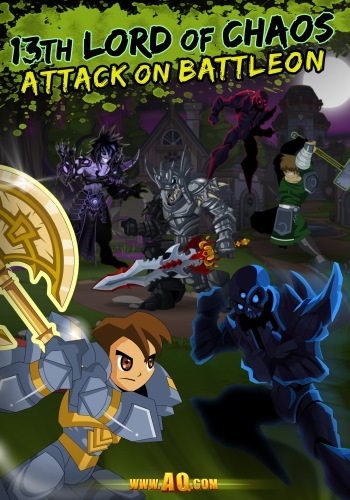 Attack on Battleon: Team PVP Event! All-new gear (like the Epic Mace and Flail!) will be available for PvP Medals or Chaos War Tokens! Defenders of Battleon: COME FORTH! The fate of Lore’s most famous town is up to you and your fellow heroes... will you fight to save Battleon, or help destroy it? If PVP isn't your thing, then never fear! Chaos monsters are appearing in maps throughout Lore, in places they've never seen before! Go on the hunt for the Chaos War medals they drop to create even more gear! If you've upgraded your account, you can also keep farming the Legendary dungeons released last week! Get more details on that here!